Barrel: 4150V steel barrel. Chambered in 6.5 Grendel, with a 1:8 twist, M4 barrel extension, and a carbine-length gas system. This barrel is nitride treated for accuracy and durability. Finished off with a PSA 10.5" Lightweight M-Lok free float rail, .750 adjustable gas block, and A2 flash hider. Bolt: Full-auto profile bolt carrier group. 9310 steel bolt, Shot Peened, Gas Key Hardened to USGI Specifications, Fastened with Grade 8 screws, and Staked Per Mil-Spec. 8620 steel M-16 profile carrier is nitride treated. What kind of blower would I need for this pistol kit? BEST ANSWER: I prefer female, but you be you. Standard AR15 lower but it must be a new lower never built as a rifle because this is a pistol kit. How many inches is the barrel from when the gas block ends? What kind of lower would I need for this kit? BEST ANSWER: Any new lower that says "multi-cal" or some such. If a lower is assembled as a rifle first, it is always a rifle in the eyes of the law, so start as a pistol. Otherwise, the ATF will talk to you about your unregistered SBR. Enter an Standard AR15 lower but it must be a new lower never built as a rifle because this is a pistol kit.answer to this question. Read the above answer, or the description and all of your questions will quickly be answered. Will this fit a pa10 lower? BEST ANSWER: To my knowledge - no. These are designed for AR-15 lower. The 6.5 creedmore is designed for the AR-10 lower. No. It will fit a PA-15 lower. You may be thinking of 6.5 Creedmoor. No. This is for an AR-15 lower not an AR-10. Is this type 2 bolt? BEST ANSWER: Yes. I have one and love it. Yes it is a type 2 bolt. BEST ANSWER: Neither, as the product description indicates, this is chambered for 6.5 Grendel (Type 2). Is this a joke?.....this has to be a joke! Neither. It's a 6.5 Grendel which is far better than 300 blk or .556 in my opinion. It's my favorite round out of all of the choices for the AR-15. Davisg, the 6,5 will not chamber to the 223/556. The receiver on the bolt is larger so the ejector will not grab the casing. Additionally the 65 is a different size shell. the 556 sits to high in the barrel which would not allow the bolt to seat properly so the weapon will not fire if a 223/556 is loaded. Neither. It's 6.5 Grendel. Great cartridge but expensive for anything other than Wolf ammo. You'll also need 6.5 Grendel mags. 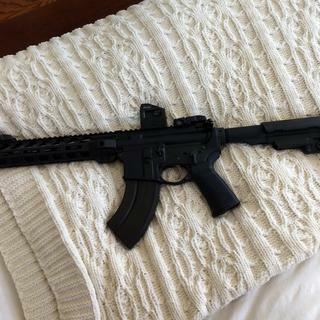 I have this upper and it's nice. Also built my own 6.5 Grendel rifle so I like it, but I'm also a reloader. It is chambered in 6.5 Grendel (.264 LBC). It fires a 6.5mm projectile. It is quite popular due to the ballistic if the projectiles. Try one and you'll love it!Enter an answer to this question. No, this is a 6.5 Grendel upper. A totally different round from 300 BO. Do not even think about putting a 300 BO in this upper. Says in the description. 6.5 Grendel. Parent case is 7.62x39 necked down to 6.5. This is chambered in 6.5 grendel. The barrel, BCG and magazine are specific to the caliber.... Everything else are AR parts. Neither, it is chambered in 6.5 Grendel. Do a quick Google search and you can find a lot about the round. No, it’s a 6.5 grendel chamber. It’s in between those two caliber. It’s a 6.5 Grendel, superior to both and VERY plainly stated. This is neither. It is chambered in 6.5 Grendel type II. No. The title specifically says "6.5 Grendel"
It is 6.5 grendel. Best ar15 caliber. It's chambered in a 6.5 Grendel. The “full auto” BCG included with this, is that the standard style? Not wanting to purchase a full auto kit. BEST ANSWER: The BCG full auto designation is really only an inference to the style of cut outs and dimensions of the BCG. The bolt carrier would be compatible with an automatic capable lower receiver. It is NOT however inherently automatic. This is very common, though there are semi-automatic only BCG's out there as well. The full auto BCG ( Bolt Carrier Group ) has more metal on it in a specific spot to make a gun with a full auto trigger group function. In a gun that does not have a full auto trigger group this bcg has no full auto effect on the gun and it is considered a standard part on many civilian AR15s and it is more common to have a full auto bcg in a gun then a semi auto bcg in most AR15s on the market today. You have to have a lower that accepts some form of fire control group from a full auto for this kit to function as a full auto. It will function as a semi auto otherwise. It is just the cut of the bolt. It is completely legal, the only time it becomes illegal is if you drill your lower to accept a full auto Sear. This is not a full auto kit ,although the bolt carrier is of mil spec dimensions. The bcg is rated for full auto but the gun only shoots semi auto. Its legal. It comes with a semi auto trigger assembly. This bolt could do either or. It's the standard bcg. It won't make your gun full auto. It is a type/rating, not a function. Ok thank you, just wanted clarification. Does this kit come with a 6.5 Grendel specific buffer tube plunger and spring or is it rated for 5.56/2.23? BEST ANSWER: An AR will run without the buffer retainer plunger, just have to pop both pins instead of break/tilt off the front pin. In other words, I don't see how it would even matter. If you're talking about the actual recoil buffer/spring, that doesn't matter either, it's absorbing the recoil from the gas port/bcg, not a larger cartridge, so that doesn't matter either. You may have to play with buffer weights for reliability, but that's an entirely different matter. The included buffer and spring are specific to the 6.5 Grendel. I saw no markings on the buffer. OK so a lower , bought solo, can be fitted to a pistol upper, and be a legal pistol? BEST ANSWER: My class 111 FFL contact stats that when you buy a stripped lower it has never been designated as a pistol or a rifle and can be built by the buyer and designated to be what ever he builds. Does the handguard on this upper use a non indexing barrel nut? BEST ANSWER: Yes, you can tell by the bottom of the hand guard where it meets the upper receiver. The bottom of the hand guard is pronounced and two bolts run through it to clamp the hand guard to the barrel nut. What weight buffer is typically used for 6.5 grendel. Info says standard ? 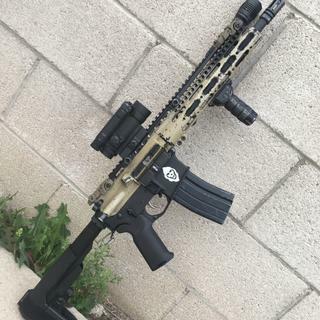 Anyone have tips on a lite weight build? My son has a 10” 300 blackout 7lbs. Great pistol kit. Well worth it. Fantastic buy for the money. The hand guard was loose and slid forward after 5 shots. I torqued the screw and ran 100 more without issue. Great pistol (rifle)... Kicks like a mule. Great quality pistol (rifle). I will be putting on a muzzle brake to help reduce felt recoil. Man this rocks. Great truck “pistol”. Solid package. Mates up well with Anderson lower. No complaints. I can hit soda cans at 200 meters with a 4x optic. Great kit for a great price. You gotta love that. Definitely has a "cool" factor. What a blast. Has yet to malfunction and is plenty accurate. Have killed a doe and several nice boars with this gun. Absolutely no complaints. Really like this pistol, shoots good. I added a tactical latch, swapped out EPT for a 2 stage trigger, 1-6 optic, quick disconnect sling swivels and Blackhawk sling. Makes a very handy package. Pistol has functioned 100%. I wouldn’t hesitate buying another one. The 6.5 Grendel cartridge is very versatile, even out of a 12” barrel. I like the pistol kit it is a perfect balance for Ga hunting. The 12” barrel handles /points great . Combined with Hornady’s Sst ammunition it was lights out for the hogs. Kit assembled good only issue was charge handle scraps in lower but it’s about smoothed out now. Shoot surprisingly soft. Adjusted gas block and have only shot Wolf steel case so far. Got cold on me so no groups but I did hit what I aimed at with confidence. It is going to be a great little hunt/truck gun with the new Vortex SE 1-8. Made it a little heavier than wanted but overall a great package. I really like this particular upper. It is very light and fun to shoot. Pretty good grouping out the door. The only thing I think keeping it from 5* is that it is pretty aggressive on bullets and brass. Everything is getting pretty defined scratches. Hope that it smooths out with some use. I really like the Grendel. Excellent ballistics and recoil is light. The only reason that I don't give this product 5 stars is that it has a very tight chamber and hates my handloads, which my other 6.5 loves. Other than that, it runs perfectly on Wolf and seems good to go. Great pistol kit at an incredible value. Great upper and the enhanced trigger is smooth. Under .5 inch groups at 50 yds, with two bullets touching on paper. Also looks great too and no failures to speak of. I took two deer today with it, shoots smooth and accurate. I would definitely recommend it.